[New for 2018] You may have noticed on instagram that Edy's is up to a bit of repackaging this year, but not so much in the traditional sense. 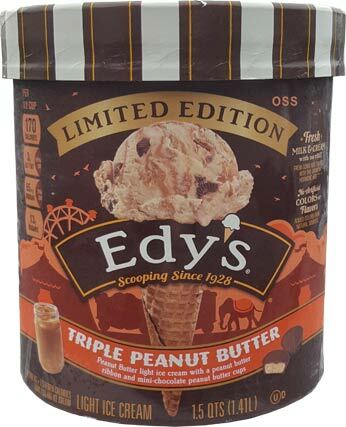 For one, their candy powered line up has completely lost all of its Edy's / Dreyer's branding, but on top of that, they are now dishing up light ice cream in brown containers instead of the traditional slow churned beige containers. Think about that for a minute. It's kind of.... would sneaky be the right word? Rovo and I were discussing it and he's wondering if they will go light ice cream across their entire line up. You could take that thought a bit further and question if it's a two-fold approach to both saving money and saving calories on the base, giving you more budget and calorie room for swirls and mix-ins. There were three limited edition light ice creams hanging out in brown containers, but we've seen the other two before. Birthday Cake makes its return after a year break and there was also S'mores which is basically just the light version of Campfire S'mores. If you think about it, even the peanut butter flavor feels familiar, so I hesitated on which one to pick up before finally leaving Roche Bros with a $4.99 container of Triple Peanut Butter. The texture almost looks spongy... but the swirls and cups and overall color do still make this one inviting enough to dive in. Sure enough, this one is fairly solid for a light ice cream. I get the feeling they've tweaked their formulas yet again (though it could just be my imagination too). I kept aiming for the peanut butter cups, otherwise this shot would be a bit more interesting. At least a big bit of swirl is still there. I still think it's funny how this flavor feels familiar, like I've seen it before. Maybe my brain just wants to line it up with last year's awful Butterfinger Cup flavor. Luckily the peanut butter flavoring isn't nearly as weird here and we've got regular mini cups here. Unfortunately mini cups offer more texture change than flavor change, but that's ok. I would love hunks of real peanut butter cups, but not every flavor can be like that. This one is about the peanut butter. The pb is fairly distinct but not too strange. I put it like that because it's a little strange, but not super strange. It's not flat, so that's good. And it's not too salty which is good. Oh, before anyone asks, yeah, I wasn't trying super hard to differentiate the base pb from the swirl pb. 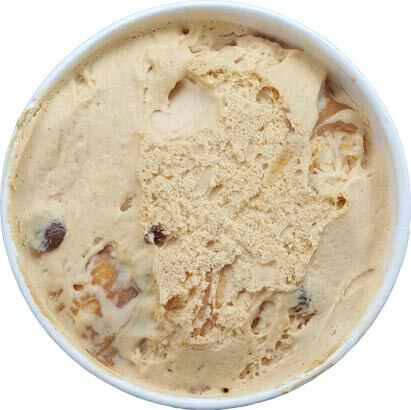 I know I should have, but I was scooping the swirl for the texture change more than the flavor. No, wait, check that. I do enjoy the added pb burst from the swirl, but at no point did the two pbs strike me as terribly different. One is just louder and not necessarily flavored differently. On Second Scoop: It's a shame this one has sorbitol because it's a pretty easy flavor to get in to. It's nice that they let the peanut butter stand on it's own without drowning it out in chocolate. Don't get me wrong, chocolate & peanut butter is a gift from the heavens, but this one is a nice change of pace while not letting anything get too weird. It's not amazing, but I appreciate its existence. 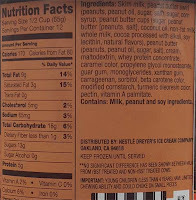 So I guess give this one a shot if you love pb and don't mind sorbitol... or if you enjoy hunting pb cups. I kept finding them in groups of three on this serving, it was pretty amusing. Foot Note: I was a bit concerned that all three of the "new" flavors might have sorbitol, but it's just this one that has it. Good for the other two I guess. I wonder if they're getting rid of the regular ice cream and sticking with light only, in preparation for the new nutritional guidelines... Maybe they think with the serving size increase and subsequent calorie increase, people won't be interested? 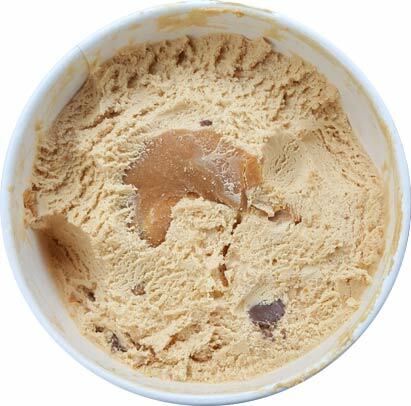 Kind of a non-exciting limited edition flavor -- it sounds exactly the same as their standard peanut butter cup flavor! This is literally the best ice cream, I have went to different stores to find it and they are all out of them! So mad I can't get this ice cream! Literally the only one I would buy honestly, it's that good!!!!! it was only out for a few months (because it's a -Limited- flavor) yet it's LITERALLY the only ice cream you buy? I'm sorry you can't find it and I'm sorry you miss it, but I think -figuratively- is the word you are looking for.